Direct Damage Games is a locally owned and owner operated small business. Started in 2013 as a collectible card game shop , specializing in buying & selling Magic the Gathering & Pokemon TCG Singles. Over the years we've added other distributors to our in stock list. As we moved in 2019, we've brought miniature gaming into our community with becoming a certified location for Fantasy Flight Games, Games Workshop, and Wizkids. - Magic the Gathering , Pokemon TCG , Warhammer 40K & Age of Sigmar Paint and Model Kits , Star Wars X-Wing , Star Wars Legion, Star Wars Armada, KeyForge, and Heroclix. - We also carry Ultra Pro , Dragon Shield, Chessex, and Accessories needed for gaming (sleeves, dice, deckboxes, and storage) . Let us know if you would like to start a game night for any game we carry - no matter the time or the day. Can do private or public game sessions. Looking to sell your magic, pokemon, or video game collection? 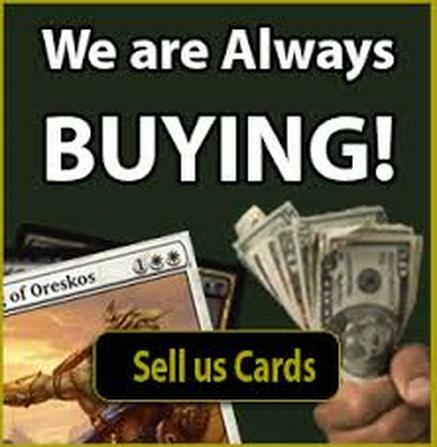 We are always BUYING New and Used cards / games & offer competitive rates in CASH and STORE Credit for your gaming goods !